Astronomers have taken what may the first picture of a planetorbiting a star similar to the sun. This distant world is giant (about eight times the mass ofJupiter) and lies far out from its star (about 330 times the Earth-Sun distance).But for all the planet's strangeness, its star is quite like our own sun. Previously, the only photographedextrasolar planets have belonged to tiny, dim stars known as brown dwarfs. 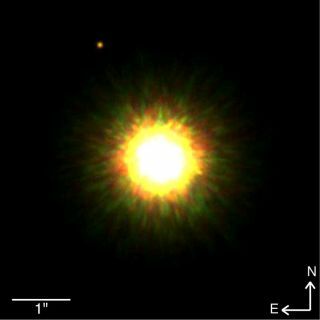 Andwhile hundredsof exoplanets have been detected by noting their gravitational tug on theirparent stars, it is rare to find one large enough to image directly. "This is the first time we have directly seen aplanetary mass object in a likely orbit around a star like our sun," saidDavid Lafreni?re, an astronomer at the University of Toronto who led the teamthat discovered the star. "If we confirm that this object is indeedgravitationally tied to the star, it will be a major step forward." Further study will be needed to prove that the planet is infact orbiting around the star, as opposed to the possibility, however unlikely,that the two objects just happen to lie in the same area of the sky at roughlythe same distance from us. "Of course it would be premature to say that the objectis definitely orbiting this star, but the evidence is extremelycompelling," Lafreni?re said. "This will be a very intensely studiedobject for the next few years!" The researchers used the Gemini North telescope on Mauna Kea in Hawaii to glimpse the planet and its star, 1RXS J160929.1-210524, which liesabout 500 light-years from Earth. Though the star has about 85 percent the massof the sun, it is younger than our star. In order to image the far-flungsystem, the team utilized adaptive optics technology, which uses flexiblemirrors to offset the distortion light suffers as it passes through Earth'satmosphere. The strange planet so far from its parent star is unexpectedbased on current theories of star and planet formation. For comparison, thefarthest planet in our solar system, Neptune, lies only 30 times the Earth-sundistance away from the sun. "This discovery is yet another reminder of the trulyremarkable diversity of worlds out there, and it's a strong hint that naturemay have more than one mechanism for producing planetary mass companions tonormal stars," said team member Ray Jayawardhana, also of the University of Toronto. The distant exoplanet, at about 1,800 Kelvin (about 1,500?C),is also much hotter than our own Jupiter, which has a temperature of about 160Kelvin (-110?C). The team discovered the new planet as part a survey of morethan 85 stars in the Upper Scorpius association, a group of young stars formedabout 5 million years ago. The researchers have detailed the study in apaper submitted to the Astrophysical Journal Letters and also postedonline. "This discovery certainly has us looking forward towhat othersurprises nature has in stock for us," said University of Toronto team member Marten van Kerkwijk.